How was everyone's weekend? Ours was pretty fun - Superbowl Sunday. I made my DIY Nacho Bar again and it was a hit. I planned to take some pics but once I set everything up I think a bat-signal went out and the horde descended. Thankfully, they all said it tasted as good as it looked. I think I only managed two bites of the corn-green chili queso. Darn it. Everything went pretty quick, lol. Side note - I make the homemade nacho cheese sauce in my big cast iron skillet. I love my cast iron. I'd use nothing but cast iron if I could get away with it. But, evidently someone (Bethany) had recently cooked bacon in my large skillet. Granted, she cleaned it, but there was a distinct bacon flavor in my nacho cheese sauce. Good thing everyone loved it! Time to strip that one down and re-season, I guess. Sunday night I was on puppy duty. Bethy was out late (pre-arranged) so I was taking care of little Hunter. Little Hunter who had to be managed every hour on the hour. I gotta tell you, he's got it down to a science. Wake, drink, eat, (and eat, drink until it's gone), out to the yard to pee once, poop three times (yes, 3), play rabidly for 5 minutes, then sleep until it's time to start over. Seriously. Gramma was very happy to see Mommy at 7am. Lol. And yes - for those of you who caught it... I'm back in the kitchen. It took me almost 2 weeks to be able to cook or prep anything in there after I lost Sadie. Knowing she wasn't sprawled at my feet, waiting for me to "drop" something, or just snoozing while I worked... I literally choked up just walking into the room. Superbowl Sunday was my big re-entry to cooking. I'm glad to be back at work in my beloved kitchen, but it definitely isn't the same. Other recipes I've done recently include a very tasty lemon-broccoli pasta dish. The original was a vegetarian version, so I added some diced rotisserie chicken to it. It was fabulous!!! The hubby says he could have done without the spinach in it, and I could have done with more broccoli, but overall it got a full round of thumbs up. You can find the recipe HERE. Another was more of a quick throw down... tried a lime-garlic skillet chicken (meh), and a wedge salad. Wedge Salad? 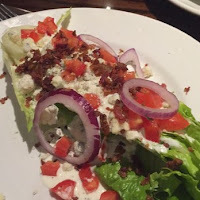 Yeah, see, the hubby and I went out to dinner a couple weeks ago and I, having read the description on the menu, ordered the wedge salad. It was a romaine wedge salad. I knew this (again- having read the menu). The hubby, hears me order it and says, Oh! I love wedge salads, I'll have one, too. The waiter serves our salads and hubby looks at his plate and says to me, what the heck is this? I say, it's a wedge salad. He says, no- no, it's not. It should be a big chunk of iceburg. I say, well it was very clear on the menu that this was a romaine wedge. He says, well, I didn't read the menu. I say, well, there you go. And I happily bite into my very yummy romaine salad (though it did have too much dressing which I had to scrape off, but don't tell him). Now, he has held this against me for two weeks, periodically reminding me that a "wedge salad" involves a generous chunk of iceburg. Finally, to silence him, I whipped up a lovely plate for him. Unfortunately, I forgot to take pics, but it was (to his delight) a quarter chunk of iceburg sprinkled with crispy fresh bacon, chopped grape tomatoes, crumbled blue cheese, and a drizzle of blue cheese dressing. It was a thing of beauty. And it shut him the hell up. Lol. 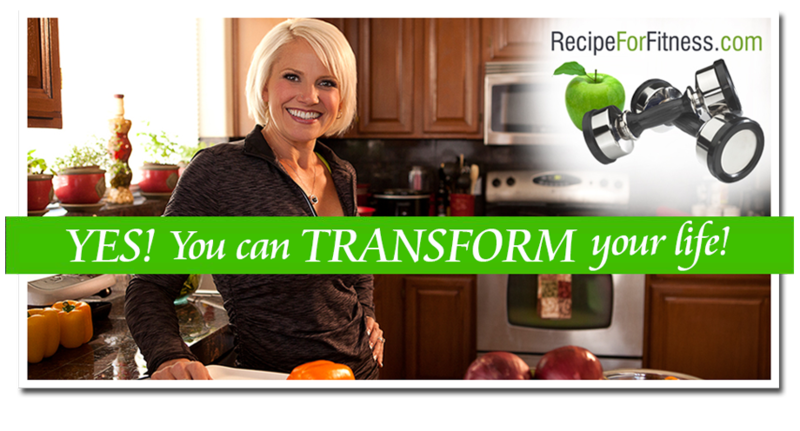 I do have some recipes up and coming for you... including a Margarita Chicken Taco and a new Protein Yogurt Parfait. Still working out the kinks, but I'll have those for you soon. In garden news... the Recipe For Fitness garden is doing well. My potato plants have sprouted, the green onions, cucumbers, spinach, lettuce and beets have all popped up, and the replacements for the lamented tomatoes are in and thriving. I continue to blanket the beds each night - though the weather has gone back to normal, it's more to keep out whatever varmint is jumping around in my garden at night. Might be cats, but they haven't left any evidence. My seedlings inside continue to grow. I'll be moving the green beans and corn out to the garden tomorrow. Yay! The peas should move in about a week or so. Wow! These are truly stunning.